Step 1 Preheat the oven to 400°F. Line a rimmed sheet pan with aluminum foil. Step 3 Cover the pan with aluminum foil (you may need 2 sheets), crimping it around the edges of the pan to seal. Roast the vegetables for 20 minutes. Remove the sheet pan from the oven, uncover, and give the vegetables a stir (keeping them separate so the beets don’t stain the potatoes). Remove any potatoes that are tender. Wearing oven mitts, cover the pan again and continue to roast until all the vegetables are tender, 10 to 20 minutes. Remove from the oven and place the potatoes in one bowl and the beets in another bowl. Stir the dill into the potatoes and the chives into the beets. Set aside. Step 5 Pour the soup into 4 bowls. Divide the warm potatoes and warm beets among the bowls, dollop with sour cream, and sprinkle with chives. Drizzle with the remaining oil and serve. Best of all, the healthy vegetarian soup recipe is super easy (and quick!) to whip up. Start by simply drizzling veggies with olive oil and roasting them in the oven at 400 degrees for about 30 minutes. After that, separately mix the potatoes with dill and the beets with chives. Next, mix the cucumbers, kefir, sour cream, onion, mint, salt, and lemon juice in a blender until they reach your desired consistency. If you love a chunky soup, pulse the liquid for less time. Want your soup extra silky? Blend it for longer and strain it afterwards. 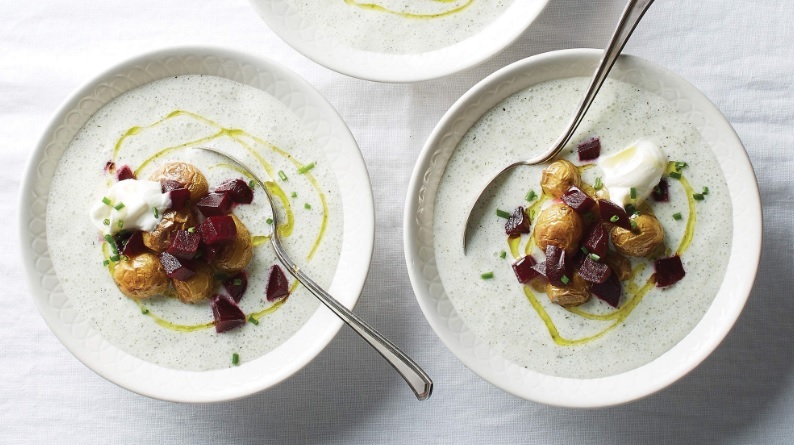 Once you’re done, pour the cucumber soup into four bowls and add the warm potatoes and beets to each, along with a dollop of sour cream for a satisfying topping. Sprinkle with chives, drizzle with heart-healthy olive oil, and—most importantly—enjoy!